Cite page (MLA): "Who is Livingstone Online's Audience?" Livingstone Online. Adrian S. Wisnicki and Megan Ward, dirs. University of Maryland Libraries, 2018. Web. http://livingstoneonline.org/uuid/node/fbe43c27-596e-4517-9823-2bfd3ff3cb55. This section describes the different intended audiences of Livingstone Online. Members of the general public. Reading Livingstone’s manuscripts can help us better understand our globalized world by seeing its formation in ways that might be surprising, such as through missionary travel, exploration, and scientific pursuits. 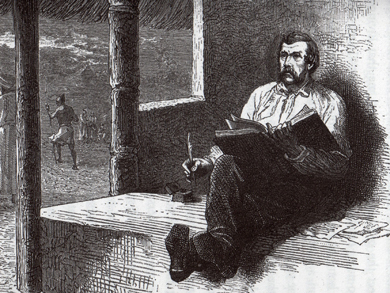 In addition to learning about Livingstone himself, reading his manuscripts provides fascinating information for anyone interested in British imperial history, colonialism in Africa, or the conditions of exploration in the nineteenth century. Students and teachers. By studying Livingstone’s words in conjunction with the objects he used, students can learn about African culture, the slave trade, Victorian science, Livingstone’s life, and intercultural contact around the nineteenth-century world. Livingstone Online includes a series of resources that give teachers prepared lessons for interacting with Livingstone’s manuscripts and the objects he used and collected on his travels. Scholars, particularly those researching on exploration, travel writing, Empire, colonial and post-colonial studies, scientific networks, and Victorian literature and culture. Our site combines detailed transcriptions and high-resolution images with essays and other critical materials that place Livingstone’s manuscripts in broader cultural contexts. Livingstone's microscope case, detail. Copyright Livingstone Online (Gary Li, photographer). May not be reproduced without the express written consent of the National Trust for Scotland, on behalf of the Scottish National Memorial to David Livingstone Trust (David Livingstone Centre). Scientists. Livingstone himself was also a scientist and doctor. His writings are full of unique primary data on medicine, geology, linguistics, geography, astronomy, meteorology, and many others topics. Today such data can enhance our knowledge of issues such as erosion in Africa, wildlife conservation, climate change, and cultural dispersion. The Livingstone Spectral Imaging Project also demonstrates how modern science can be used to enhance our knowledge of the nineteenth century. Librarians, digital humanists, and information technology specialists. Livingstone Online relies on an array of international standards for web access and preservation. We work with specialists from a variety of disciplines to create high quality digital data that can be sustained long into the future. Our emphasis on transparency, knowledge transfer, and documentation means that anyone can look “behind the scenes” of our project and learn, in detail, what we did, how we did it, and even how they might do it better.